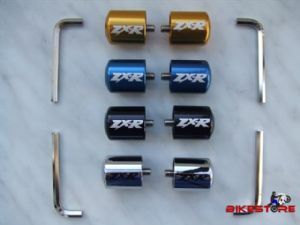 BikeStore - Kawasaki Bar ends weights - ZX-R Logo! Kawasaki Bar ends weights - ZX-R Logo! Select option to see exact price. These Bar Ends are machined out of Billet Aluminum. They are shaped similar to OEM and will install on most Kawasakis without any modification. They have "ZX-R" Logos for a clean, custom touch. Our Bar Ends are Anodized for a Lasting, Durable Finish.